When kids act out, they have an arsenal of backtalk they fire at you in order to put you on the defensive—a secret language that’s designed to win them control and absolve them of responsibility. If you take those comments at face value—or take them to heart—you’ll always be on the defensive, constantly reacting to a child who’s out of control. 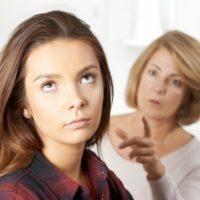 In this article, we examine the most common backtalk that kids hurl at their parents when they act out, what they really mean, and how to respond to them in an effective way that puts the responsibility to behave appropriately where it should be: on the child. When kids act out, they aren’t always confrontational. One way children get around the rules of the household is to procrastinate and put their parents off until they eventually stop asking kids to help out. While many parents rationalize, “It’s easier if I just do it myself,” you need to understand that giving in to your child gives them a false sense of entitlement, a sense that “the world owes them something” and that they do not need to meet their responsibilities. Kids generally say “whatever” to their parents when they’ve already lost the argument. It’s backtalk that is a final attempt to anger you and to retaliate in some small way for something that your child doesn’t like. Your best bet is to ignore it. If a kid says “whatever,” the odds are that the point has already been decided and you’re in charge of the situation. “Whatever” is their weak way of trying to save some face. If you’ve come out on top, don’t compromise your position by letting them draw you into an argument. If you give the “whatever” power and you accept the invitation to the argument then you will lose the ground that you’ve already gained. Translation: It doesn’t bother me; I don’t care; it doesn’t matter. Effective: Ignore it, smile and turn around and walk away. You’ve already won the fight. Eye-rolling is a form of non-verbal backtalk and is a piece of cake to deal with. Like all annoying behaviors, it is meant to be a little rebellious and somewhat power-challenging. Many parents feel that when kids roll their eyes, they’re being disrespectful or somehow challenging their authority. I say, “So what?” If you acknowledge eye-rolling and argue about it, you’re giving your child power he didn’t earn by being productive. The simple answer? Don’t acknowledge it. I guarantee you that if you ignore eye-rolling it will either go away or become comical to you. I suggest you say what you have to say to your kids, and then don’t wait for the eye-rolling. If you’re in a conversation where eyes are being rolled, just keep focusing on what you want to communicate. Like many annoying behaviors, it’s harmless, and the best way to deal with harmless, annoying behaviors is to ignore them. At times, children will verbally draw a line in the sand, stare you in the eye and say “You can’t make me.” This is backtalk used to draw you into a fight, and it’s important not to start fighting. By responding with “Oh yes I can,” there’s a threat implied, and it’s only going to further escalate the situation. You’re giving the child control by accepting the invitation to fight. Don’t engage your child on her level; don’t join the fight. Instead, put aside your emotions and focus on the matter at hand. Translation: I don’t want to do what you’re asking, and I’m looking to start a fight with you. Do you dread the threat of a temper tantrum and feel like you give in to your child’s demands in order to avoid an outburst? You can defuse a tantrum and help prevent future tantrums by using an effective response aimed at teaching your child that acting out is not the way to meet his needs. Child: “I want it now!” followed by a tantrum. Translation: If I escalate my behavior, you’ll give in, and I’ll get the cookie. This worked the last time I wanted something. Effective: “Don’t act that way. It won’t help you get the cookie.” Then turn around and walk away. Children (and adults) can be forgetful and certainly a reminder to do their work or complete a task is appropriate. But when kids use “I forgot” on a regular basis, it becomes a way to justify irresponsible behavior. As an excuse, “I forgot” means the child is avoiding a certain task or responsibility that they don’t feel they can perform and don’t know how to get help with. Or they could be acting lazy and just don’t care. Laziness explains as much irresponsible behavior on the part of children as any other explanation. Sometimes laziness can be interpreted as “I’m tired and I don’t feel like it.” Sometimes laziness can be interpreted as “My life’s not going to get better anyway, why should I try?” In either case, laziness doesn’t empower the child to take care of business. Translation: I don’t feel like it. Or, why should I try? Of all the backtalk in your child’s arsenal, the words “I hate you” can have the power to reduce any parent to tears or anger. Children know that saying this can paralyze a parent during a fight, which is why they say this to get what they want. Here is how to focus the argument back on the issue at hand and reduce the emotional sting of your child’s words in the process. Translation: You won’t let me go out tonight, so I’m going to talk hatefully to you so you’ll get upset and give in. Children often use guilt to manipulate us. This is just another version of “I hate you” and, again, they use this backtalk to get what they want. Don’t give in. Here’s how to deflect the guilt by using an effective response that puts the emphasis where it should be: on your child and the importance of following family rules. Many times, kids will try to lay blame when a responsibility has not been met. So respond with, “It’s not my fault, it’s your responsibility.” The reason why finding fault is not effective is that focusing on the past will not solve your child’s problem. Focus on the present—the present is where problem-solving starts. Translation: I’m not going to take responsibility for not getting my homework done—I’m going to make it your fault. Children can be adept at shutting down and shutting you out—leaving you with unanswered questions and a whole lot of frustration. Keep in mind that it is completely appropriate for kids to have their own space and that “Leave me alone” is appropriate and often should be accommodated. But, you should set limits and make clear to your child that being left alone for a while is not a free pass. Don’t overreact to requests for space or time alone and don’t get stuck on your child’s tone unless they’re rude or demeaning. If you find your child is shutting down every conversation with “Leave me alone!” or “It’s none of your business!”, here are some ways you can handle their backtalk and make sure the issue at hand gets addressed in the appropriate way without getting into a power struggle. Translation: I don’t want to talk to you about this, I don’t want to perform this task, and I’m going to shut you down so I don’t have to. “Ok, we’ll talk later,” and walk away. When a child says to you, “You’re just trying to control me,” usually he or she is inviting you to a fight. 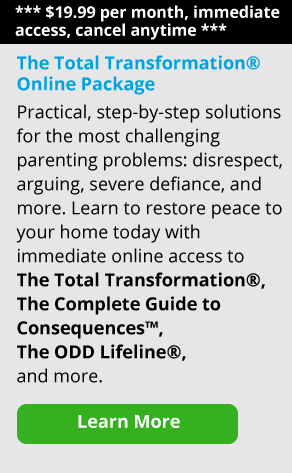 The perception for parents here is that your child is challenging your authority. If you respond to that, you’re giving them more power. Try not to get into a power struggle or screaming match, and don’t deny the obvious. Sometimes parents say, “No, I’m not trying to control you,” when in fact, they really are. Generally, the best thing for you to do is to avoid that argument. Remember, you don’t have to attend every argument you’re invited to. Translation: I’m not going to do what you’re asking me to do—instead I’m going to argue with you about it. When a child wants to get out of meeting a responsibility, the quickest way to do that is backtalk meant to make you angry. Don’t fall for it. When our kids say something is boring, they’re often expressing a low level of frustration. This frustration may come from not having anything interesting to do, or it may be that the task they have to do isn’t exciting and requires attention and energy. So when you say, “It’s time to go do your math now,” and a teen responds, “Math is so boring,” they’re expressing a low level of frustration and anger about having to do their math homework, probably because math is both boring and difficult. I tend to honor these kinds of statements in the affirmative. When a child tells me he’s bored, I say, “Can I help you with any ideas on how to make it easier to deal with?” If he says yes, I try to process some choices with him. If he says no, I say, “OK, well, if you change your mind, you know where to find me,” and then go on about my business. Remember, as a parent, it is not your job to fix your child’s negative feelings or solve his social problems. It’s your job to teach him how to solve problems such as figuring out something to do. It’s also your job to let him experience the negative feelings that the problem of boredom is triggering. Translation: I’m angry and frustrated because math isn’t exciting and is difficult. For parents of younger children who are bored the solution is simpler: give them something to do or give them a choice of two things to do. You can start by asking them if there’s something they’re interested in doing, but don’t push them to make a choice. You can also create tasks and jobs for younger children, such as having them help you in the kitchen or in the yard. This can redirect their energy and dispel their feelings of boredom. Almost every kid will eventually have a teacher they don’t like, but that’s not an excuse for them to refuse to follow the rules of the classroom. When you side with your children in this situation, you are actually undermining your own authority in the process. The bottom line is that it’s a mistake to denigrate authority figures with your children. Keep the focus on the matter at hand and off your child’s feelings about their teacher. Translation: I don’t like my teacher. Therefore, I don’t have to comply with what she asks me to do. When you have more than one child, from time to time they might ask you if you love one sibling more. This is not unusual, and sometimes children will put the question to you in an offhand way, pretending that the answer isn’t really that important. And then your child will say, “But what about Jessie?” And you can say, “I love Jessie too, but I want you to know that I love you. Never worry about that.” Kids will sense that you love them, but there will be times when they crave affirmation, and it’s important to give it to them. Many times, during an argument or power struggle, kids will say, “He always gets his way,” or “You love him more than you love me!” When they do this, they’re either trying to manipulate the situation or distract you as a parent. This has nothing to do with love—it’s backtalk. Translation: He’s more lovable than I am, so you let him have his way. When you are raising or helping to raise a child that is not biologically your own—whether you’re a stepparent in a blended family, an adoptive parent, a foster parent, or are bringing up your grandchildren—kids may sometimes use your role against you in the heat of an argument. When a child says “You’re not my mom or dad,” what they’re really trying to do is take your power away. Focus on your role as caretaker and calmly remind the child what the rules are in your house. The whole idea here is to avoid a power struggle. The child is inviting you to a fight and you should decline the invitation. Instead, just restate your role and the rules. It’s very important that you verbalize no judgments about the biological mother or father. Judgments will only lead to more anger and resentment, which will lead to more power struggles. Backtalk is frustrating. The same fight seems to repeat over and over again and it wears us down. But, use that repetition to your advantage—prepare ahead of time and have your responses ready for the next time. Being prepared will enable you to manage these episodes with calm confidence and will keep you from getting dragged into a power struggle. So, prepare and practice and then execute when the inevitable happens again. And give yourself a break if it does not seem to go right every time—this takes practice for you and it may take some time for your child to adjust to your newfound confidence and authority. Finally, if your child says something that you are not prepared for then take some time after the fight to figure out how you will respond in the future. You can get additional support and help with these issues from our online parent coaches. Our coaches have worked with thousands of parents and are experts in James Lehman’s The Total Transformation® parenting program. If you prefer a local resource, a great place to begin your search is Psychology Today, which is the leading site on which therapists list their services and you should be able to find many in your area.